There are an infinite number of ways to go about this task. There really isn’t a “right” answer. And if I’m being completely honest, cover letters often go unread. But you never know who your cover letter will reach – one of the readers, one of the “scanners” or one of the non-readers – so you have to craft a well-written cover letter with each application. Writing cover letters is also a great exercise in fully thinking through your qualifications for a particular role. And this is my key guidance for writing a cover letter: your primary task is to draw connections between the job description and your skills & background. You want to make it as obvious and easy as possible for the person reading your cover letter to understand why you are a great candidate for the role. Make your target company interested in you. They’re looking for a productive employee and (most likely) an interesting person, so you need to find clear ways of communicating these things. 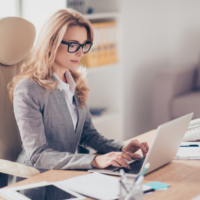 Connect your expertise with the key requirements of the job description. This is also why it is important to customize each cover letter for each new role. Fill in any blanks that may be confusing or difficult to address in a resume. Examples that I’ve recently coached to were “Yes, I currently own my own business but I am interested in joining an organization once again,” or “While I have quite a bit of experience, I am open to a range of possibilities involving title and compensation.” Calling these types of scenarios out in the cover letter is your best opportunity to allay the kinds of objections that may prevent your resume from reaching the right people. As a helpful tool, I’ve included a link to the template that I’ve used as an example in coaching conversations below. It’s a simplified approach to what often feels like a very nebulous part of the application process. I hope these tips are helpful. The new year usually sparks many new job searches and many new opportunities. It’s an exciting time. Be prepared with the right strategy.